Complete revamp of a previous upload. 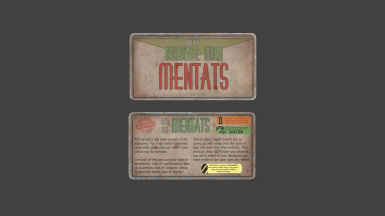 Mentats flavors are now randomly distributed throughout the Commonwealth. DieFeM has graciously added his scripting ability to my re-texture. 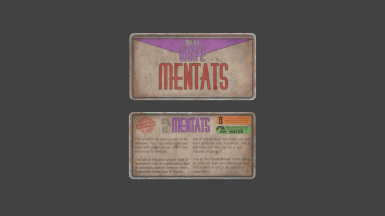 Mentats flavors are now randomly distributed throughout the Commonwealth. 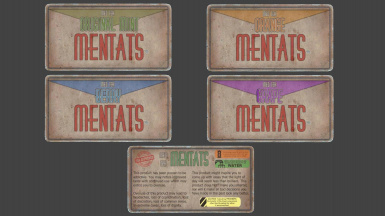 So you will no longer only find the original 'mint' version laying around, but all four flavors. Each flavor now has it's own texture, and a slightly humorous description on the back, giving a general idea as to what it does. 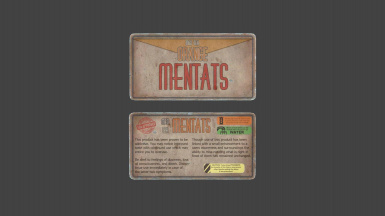 To the 50 or so people that downloaded my previous Mentat re-texture, the .esp was BAD. The wrong .esp was uploaded and besides renaming the Mentats, it renamed a majority of in-game consumable and misc. items to what I currently have them labeled as in my game, NONE of you informed me so I don't want to hear any whining now, just delete it in it's entirety and use this one.